This is the fourth project from talented songwriter Josh Wilson. 'Carry Me' was produced by Matt Bronleewe who worked on some of Chris Tomlin's albums and Josh's previous album See You. Josh deals with issues of his personal health and dealing with anxiety and panic attacks on this album. It's a brave songwriter to write songs about such topics, and this must be commended. 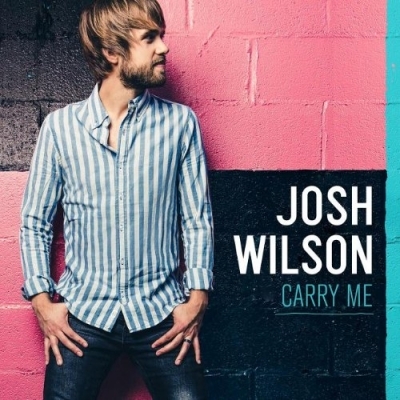 Read More This is the fourth project from talented songwriter Josh Wilson. 'Carry Me' was produced by Matt Bronleewe who worked on some of Chris Tomlin's albums and Josh's previous album See You. "Philippians 4 says, Do not be anxious about anything... the peace of God will guard your hearts and minds in Christ Jesus," Wilson shares. "I prayed for that and each day would say, 'God, I can't make it without you. I need you to carry me.' And He did, and He still does. He carried me through each day even before I experienced the anxiety, but I just didn't realize it. It took these difficult moments for me to realize how much I need Jesus." I don't usually say this about album covers, but I really like the colours of this one. Of course you have the modern worship leader pose with it, but it's an album cover that stands out. On to the music and when I started listening to opening track Pushing Back The Dark I almost wondered if I had accidentally pressed play on an Ed Sheeran album. The answer was of course No, but wow how much does Josh Wilson sound like the ever so popular Ed Sheeren? This opening track is a brilliant upbeat number that will get listeners dancing around the room. Title track Carry Me leans on its very radio friendly chorus, but what I enjoyed most about this track were the lyrics of the verses. "Please don't let these worries get the best of me". There seems to be a lot of lyrical meat in the verses, and the simple, yet effective chorus actually works very well with this song and I can see why it is the title track. The more this album goes on, the more I preferred it when Josh uses his songs to tell stories. I think this is where Josh is at his best. There are a few songs on this album that are catchy but don't have the lyrical depth of tracks like the brilliant I See God In You. People who follow LTTM will know I have been a fan of Josh's work for a long time. From his album See You to his last release Live From The Carson Center I have really enjoyed the style and sounds of Josh Wilson. My worry about this album is that he has moved away a bit too much from the acoustic mid-rock genre into a slightly more poppier, catchy chorus kind of album. Some would say this is just a musician moving forward and branching out, and I can appreciate that. There are just times I want the album to have more songs like What A Mystery, as this song really does have its own unique sound, the kind I fell in love with in his earlier work. As I said at the start of this review, anyone who sits down to write songs about such difficult and personal issues deserves to be applauded. A perfect example of this is the brilliant Here I Am Anyway which is about being here for God to use even when you're not sure if you can do the job. These lines sum it up: "If there is weakness that you want, I got more than enough... God I don't have what it takes, but here I am anyway". This is one of the most honest songs I have heard this year, and indicative of the album as a whole.